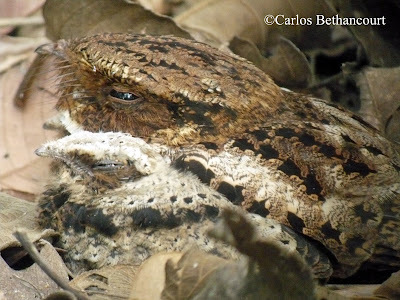 I just wanted to share a pic of a nesting Rufous Nightjar. As you notice on this pic it has two chicks. It's the first time I see a nightjar chick. 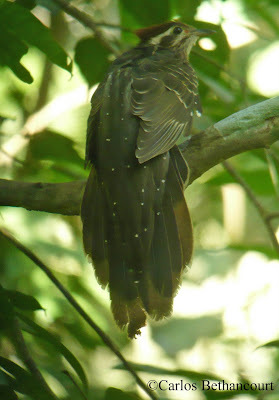 About two years ago I found a nest on Old Gamboa Road with Jean Iron, a friend from Canada, but we were monitoring the bird and no chick wa seen. But this year we discovered this beautiful bird almost on the same spot! By the way Jean came back on March and Alexis found it with her too, so now Jean's nickname is the Nightjar. I took this photographs last Friday, April 17th while birding with the famous world traveler and blogger Charlie Moore. You can also check his report here. Early morning that same day we had also seen this Pheasant Cuckoo on Pipeline Road. 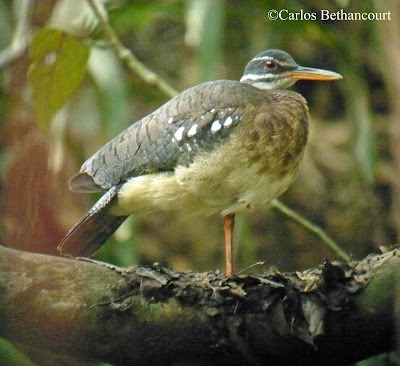 This bird has been observed by our team of guides near Juan Grande creek and at the entrance of the road for the past month, even though it has not been very vocal this year! Finally, on March 30th while leading a birding trip with Sam Fried, we observed a Sunbittern building a nest on Plantation Road.